In this last video from the Aventura Spa Palace in Riviera Maya, Mexico, we look at the four phases of Group Dynamics as they relate to the Relationship Diamond. The study of Group Dynamics has identified four distinct phases in the formulation of a working group. Interestingly, the phases fit very nicely in our Relationship Diamond model as we superimpose them over the dynagram. The first is the Form Stage and that has to do with structure. Most relationships start with some type of structure. From a law enforcement perspective, it could be a call for service, a traffic stop, a consensual encounter on the street, or a Crime Watch / Community meeting. During this phase, you will begin to establish your integrity, a key component of police ethics, in the eyes of the other party. The second is the Storm Stage. When you start to open up channels of communication, the relationship can get very stormy. And the more diverse the two groups, the stormier the seas. But you must be willing to weather the storm, just don’t get stuck there. The third is the Norm Stage. It is here that the group begins to establish their roles and responsibilities as well as lines of accountability. The final stage is the Perform Stage. This is where the work actually gets done. Resist the temptation to jump around the bases prematurely. So many groups stall out at first base or try to jump from first to third. You can’t do that in a baseball game and you shouldn’t try to do it in a relationship either. In this stage, you will employ strategic problem-solving methodologies to accomplish your community / coactive policing goals — such as establishing peaceful and safe neighborhoods, and stable and successful families. Building working relationships between law enforcement and the community is a tricky business. But understanding the process so that you don’t get frustrated is a key step forward. Third Base in the Relationship Diamond is establishing a Partnership. But it requires mutual accountability. Think about the Crime Watch organizations that you have been affiliated with in your law enforcement career. How many of them last past the first few meetings? Yet there are some Crime Watch groups that have been successful long term. Those are the ones that have learned to build accountability into the community policing philosophy. Mutual accountability involves us (the police) giving the citizens permission to hold us accountable. But it also requires them to give us permission to hold them accountable, a critical step in the Coactive Policing model. Remember that accountability is the last component of the Trust Formula and must come last in the process, after establishing your integrity and opening the channels of communication and understanding. We are so quick to point the finger of accountability at others before we have invested time and effort into building the relationship first. After a trust-based stakeholdership has been established with the community, then and only then should accountability be introduced. Otherwise, the relationship will not be strong enough to withstand the stresses that are about to be placed on it, especially if we are working to “demolish” a criminal stronghold where trust of law enforcement tends to be low. Recorded at the beautiful Aventura Spa Palace in Riviera Maya, Mexico, we look at the next step in the Relationship Diamond – building a stakeholder interest. That’s why open and honest communications are so important. Let me illustrate this principle with a humorous example that I have used over and over again in community settings. Imagine that you are a citizen living in a criminal stronghold. You are frustrated with the police, but know only what you have learned from TV shows, movies, and conversations with others. You watch an officer pull up in front of your house, get out of his car, and then do what all of us do when we get out of the car. He pulls his gunbelt up. Now, that is a very innocent adjustment of some uncomfortable police gear that means absolutely nothing to the officer. But it sends an entirely different message to the citizen. Set up the example the next time you are speaking to a community group and ask them what they can already tell you about this officer and his attitude based on nothing more than their observance of his body language. Know what the citizens will say? “He’s arrogant. He’s got a bad attitude. He’s looking for trouble.” None of those things are true. But do you think the citizen’s preconceived notion about this officer and his attitude will have any impact on the contact that’s about to take place? And the first question out of the citizen’s mouth is, “What’s the problem, officer?” Now, out of all the things that the citizen could think to ask, why do they ask this question? Because the only time you’ve EVER been there in the past, there was always a problem! This is due to the limitations of Reactive Policing. To overcome these types of conflicts, we must initiate open and honest communications with the citizens, and in so doing, develop a stakeholder relationship where they begin to view crime as a community problem that demands a coactive, community response. While snake-hunting along the Edisto River at Givhans Ferry State Park, I paused to record the next video in the Dynamic of Relationships series. 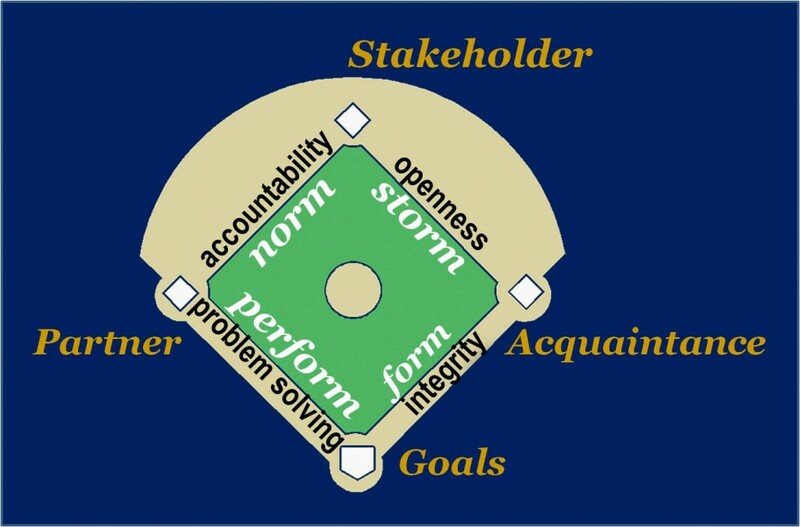 Once we have identified the “bases” on the Relationship Diamond, the next question becomes “How do I get around the bases?” I think the answer is found in the Trust Formula. It’s our Integrity that gets us to first base. Openness gets us to second. Accountability takes us to third. And strategic Problem-solving methodologies take us home as we accomplish our Coactive Policing goals. So the Trust Formula becomes the baselines in our model of building trust-based community relationships. Integrity is defined as “being who you represent yourself to be.” It is character and competence working in tandem. And it’s not only your actual integrity, as important as that is. It’s the other party’s perception of your integrity. One of the quickest and easiest ways to establish your integrity in the eyes of the community is to do what you say you are going to do. As simplistic as that sounds, we often neglect a critical component of this. We get so focused on actually DOING our job, that we forget to tell the citizen what we intend to do first. If we discipline ourselves to tell them what we are going to do BEFORE we do it, we ground their expectations in reality. So instead of evaluating the effectiveness of our policing activities by their own skewed expectations, WE set the standard of law enforcement and community policing performance. This is such an important concept that I devote an entire training series, the Dynamic of Expectations, to developing it more in depth. Building trust-based relationships is a complicated process and it’s easy to get lost in it if you don’t appreciate the underlying dynamics. Filmed from my balcony at the Continental Hotel in Oradea, Romania, overlooking the Repide River, I use the Relationship Diamond as a model for understanding the process of building community relationships. There are essentially four steps in building a working community relationship and you must progress through them in order, just like running the bases in a baseball game. First base is to become an Acquaintance. This is a bit common sensical but it is a necessary first step. 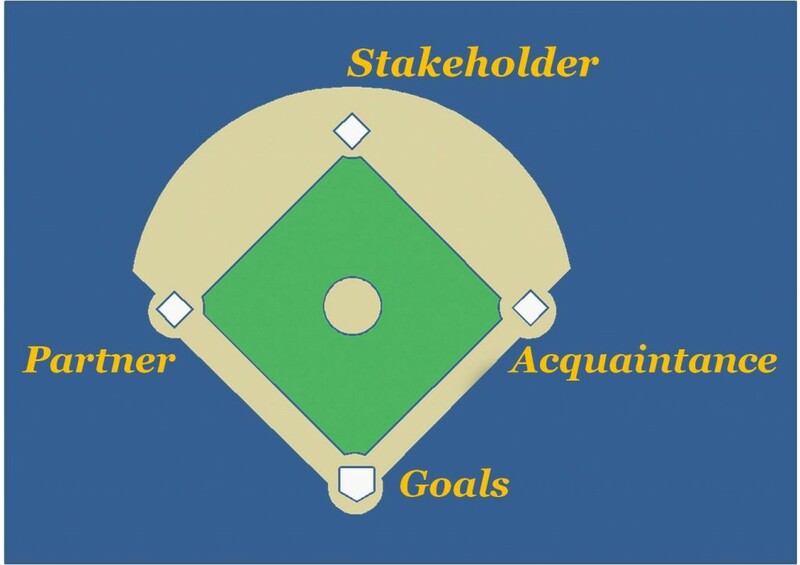 To get to second base, the citizen must become a Stakeholder. That is, they must see themselves as having a vested interest in the crime-fighting process. As Sir Robert Peel said, “The police are the public and the public are the police.” But the citizens don’t often think of themselves in that way. They tend to see crime as exclusively a police problem, not a community problem. Third base is Partnership. This is a working relationship where the police and the community team up to coactively solve problems that are manifesting themselves as crime, fear of crime, and neighborhood decay. After reaching the partnership level, the group is now ready to head to home by accomplishing some of their coactive policing goals; two of which are establishing safe and peaceful neighborhoods; and stable and successful families. This first installment of the Dynamic of Relationships series was filmed inside the Bear Cave in Bihor County, Romania, in that region known as Transylvania (so appropriate this close to Halloween). The lighting in the cave was poor, so please excuse the poor video quality. Our simplified definition of integrity is “being who you represent yourself to be” — otherwise stated as your character and competence operating in tandem. Openness has to do with honest and open communication — essential for building trust. Keep this in mind, your community does NOT understand you… but it THINKS it does! So you must take the initiative to break down the barriers to communication. Accountability is a two-way street. The police must be willing to give the community permission to hold them accountable, but the community must also give the police permission to hold them accountable as well. When we were in grade school we learned that there was a property of addition that allowed you to add a series of numbers in any order and still get the same result. It doesn’t work that way with the Trust Formula, for reasons that we will see later. The three factors necessarily must come in this order: Integrity, Openness, and Accountability or the process will fail. The elevation at the Dead Sea is 1300 feet BELOW sea level making it the lowest spot on the face of the planet. Consequently, it’s average atmospheric pressure is the highest anywhere on Earth. I took advantage of our visit to the Dead Sea to not only clean some of the desert grime off of me, but also to talk about the unique pressures that face police professionals and their families. What is it that makes law enforcement one of the most stressful of all professions? The average citizen might say it is the long and crazy work hours. Or maybe the long periods of boredom punctuated by moments of extreme terror! Or maybe it has to do with seeing people at their worst and dealing with the underbelly of society. Or it could be the trauma that they witness on a regular basis. All of these factors contribute to the stress load. But as stressful as law enforcement is, it is interesting that most police professionals will say that the most stressful part of their job is not what you would expect. Typically, they will say it is internal relationships! In other words, this job is stressful enough. But what’s REALLY stressing me out is all these crazy people I have to work with…! The character-based principles of Police Dynamics are all about building trust-based relationships both internally and externally. So strengthening internal relationships not only makes a law enforcement agency incredibly more effective in accomplishing the police mission. It has the added benefit of reducing the stress load that each officer bears on a daily basis. I have been home on extended leave for almost two months now and have been so caught up in family events, reconnecting with old friends, working on my Masters, and getting ready for my next deployment, that I have totally neglected the blog. 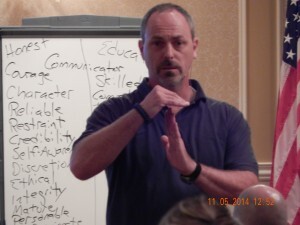 However, I hope to get some more training videos posted as early as next week. In the meantime, one of the officers that worked for me at the Summerville Police Department years ago tracked me down the other day and had some real nice things to say about me and the training he received. During that time, Police Dynamics had not yet been developed as a curriculum, but I was still promoting many of the principles. Plus I provided some defensive tactics training to the officers as well. Earl Worsham was a “cops cop!” He was the one I sent into the high-crime areas like Brownsville to clean out the criminal element. For those of you who have attended a Police Dynamics seminar, you may remember the story about Brownsville that I tell in the Dynamic of Relationships. Crime was so high there that the Post Office would not deliver mail! Rain, snow, sleet, the dark of night, would not stop the US Mail. But Brownsville stopped it! I was saying how proud I am of your accomplishments, and how thankful I am to have had the privilege to serve under you in Summerville. I wish I had followed you. I can’t underestimate the value of your support as I relentlessly pursued the criminal element. I want you to know that I was so proud to be a police officer and that your training was the foundation of any sucess that I had. I knew your expectations and professionally I can honestly say that I stayed within those bounds. You taught me how to conduct myself as an officer, and how to defend myself in my contact with deadly criminal forces. I can’t begin to tell you the times I faced deadly situations that could have went bad without the knowledge you bestowed upon me. It was never the same after you left for me. I will always miss it and will always be a cop in my heart. I hope I did some good. God bless you and keep you, Ray Nash.